I have been noting done issues for the past month. Following are bugs / requests for enhancement. - Inspections aren't active in <%! %> declaration sections. In particular doesn't show unused variables in <%! %> sections. And doesn't show missorted modifiers in <%! %> context. "Cannot perform refactoring. Safe Delete is not supported in current context"
- Wierd behavior when doing introduce constant in a jsp <% %> context. it creates it at the very top of the file. Should be ahve the @page imports. + problem #2: It doesn't insert a newline before the new constant declaration. So, after doing CTRLALTC a few times, I have several declarations all in one line. - JSP Formatter needs serious work to become useful. how we want JSPs formatted. + We need control over how the <% %> blocks are formatted. - Option to always place <% and %> at column 1. - Merge contiguous <% %> blocks, e.g. formatting when this is unchecked. - Could have special handling for oneline java statements. Another bug I forgot to mention. (I might have already filed Jira on this). 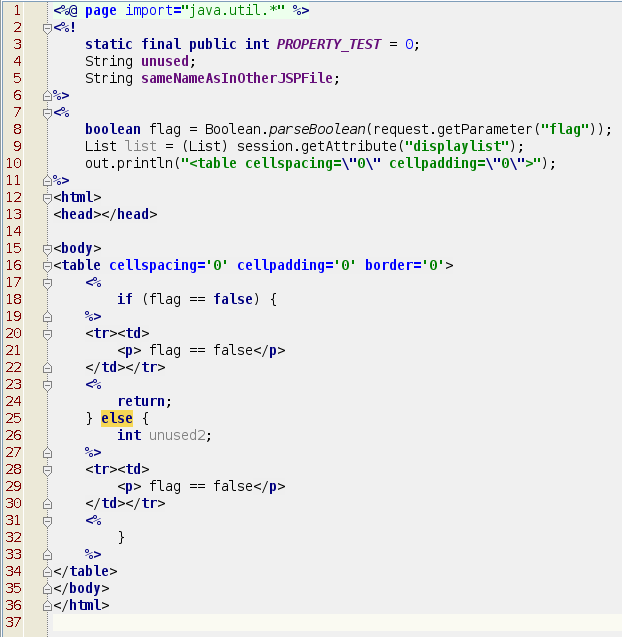 For this simple exmaple they are identical, but in my workspace I have many JSP files which declare variables with the same name in their local <%! %> scope, but they are used differently and in fact have nothing to do with each other. The java code in Test1 <% %> can't access myVar and myStaticVar in Test2, and vice versa. A slightly different scenario which has the same problem is when I am trying to find usages within a JSP file of a variable which is declared in an included JSP fragment which is shared amoung many JSP files. The find usages should show me the usages only within the JSP file I am in, not in all the JSP files. For example, I have a file Global.jspf which defines some common variables like platform, user, etc. When I am editing A.jsp which includes Global.jspf, if I do find usages on platform, I should only see the usages in A.jsp and Global.jspf. Bad code formatting in JSPs that declare content-type "application/xhtml+xml"
Being able to edit JSPs just like plain text would be so much better sometimes. hardcoded warning for legal code is a bad compromise and not very IDEA-like. Yes, the formatter and line indent when hitting RETURN at end of line is the most annoying problem. In large, complicated files, I can't trust the formatter to do the right thing since it is usually confused and gets the indent levels wrong. IntelliJ should be calculating indent levels of the java code without regard to indent level of '<%' or '%>' or the indent level of the the html tags. Actually, I suppose someone might like it to indent starting at '<%', but that only works if the formatter can place the each '<%' at the right level. It looks like IntelliJ newline indent algorithm is just looking at the enclosing indent level of the '<%' rather than backing up to the last line of java code. If I move '<%' 10 spaces in, and then reindent "int a;", it will be indented starting at position of the '<%', rather than the previous last java line, or in this case, the outer class level which should be indent level 1. I guess this may be personal preference, but I think of all the code within the <% %> blocks as being part of one big method, so I want them all indented at the same level, irregardless of the position of '<%' '%>' tags and the html tags. Both the test() method and the <% %> block are works in progress. If I was in midstream of writing test() method and hit RETURN after the if statement, it is indented to the proper level. But if I hit RETURN after the if statement in the <% %> context, it is indented level with the if keyword, which is wrong. Here's a wierd quirk with the Narrow Scope insepction. And it still says that the scope is too broad, but invoking narrow scope further does nothing. "Newline after [ <% %>]" is that the refactorings and intentions don't know what to do. It would be nice to have this configurable in a JSP tab in Code Style settings and then have refactorings and intentions use that. Another request I had forget to mention was for IntelliJ to be smarter about copying text from HTML context to java <% %> context and vice versa. The opposite should also work, so if I highlight an expression which evaluates to a String, I should be able to paste it into an HTML block and any java varaiables will be wrapped in <%=variable%> blocks. I can think of even more helpful things along these lines, but it starts getting complicated. I have had situations where I had a ton of servlet java code which I wanted to convert to JSP code, and the ability to transform the text would have been very useful. Inspections aren't active in <%! %> declaration sections. To me unused private members are shown. Nonprivate members are not highlighted even in java. Safe delete local variables is really not supported. This has nothing to do with jsp. two more annoying issues are resolved. Sweet. Thanks a lot! I slogged through a bunch of the JSP Jira requests, and came up with the following outstanding issues which have reproducible examples which I verified as still broken as of 4125. Most have to do with JSP formatter, auto-indenter, editing, syntax highlighting. I found that the following bugs were fixed. P.S. The Jira database is already a mess, with lots of stale bugs. Here are some requests for advanced refactoring specific to JSP pages. Ok, I understand that safe delete local variables is really not supported. But the real problem is that JSP includes really breaks alot of assumptions. Better to think of JSP files as scraps of java code which can be combined together to form different combinations of java classes. public, protected, package private, private doesn't mean anything. 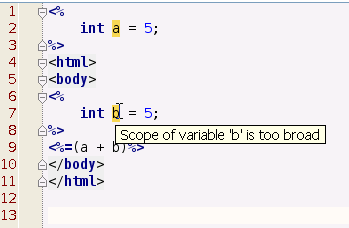 The scope of the variable is the JSP file(s) that contain the variable declaration. I'm not an expert on the JSP specification; Is there some way a JSP file can access a variable declared in another JSP without including it? For example, the "unused private variable" will fail in the following example. and all these bugs have been driving me nuts! OK. I filed new requests for the items mentioned above which didn't have existing Jira requests. Please vote and/or comment if you like. JSP - Private field 'unused' false positive when included JSP fragments use the field. I wanted to highlight one of the requests I filed. Please comment if you have any ideas. I think the JSP formatter really needs some customizable settings in order to be useful. For example, there is no control over how <%! %> and <% %> code blocks are formatted. Currently, IDEA appears to indent code based on the indent level of the most recent <% tag. 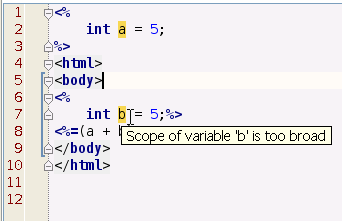 For example, the java line below is indted from the spot of the <% tag. I think of all the code within the <% %> blocks as being part of one big method, so I want them all indented at the same level, irregardless of the position of '<%' '%>' tags and the html tags. 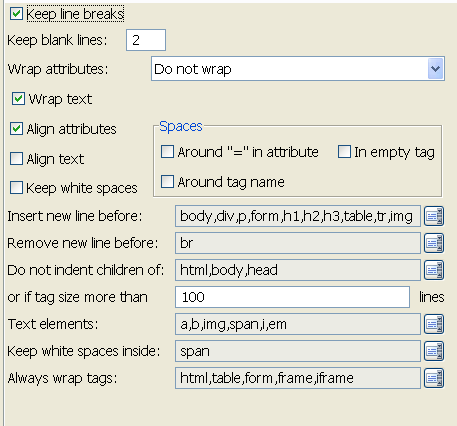 The other big issue is there is no control of newlines before and after the <% and %> tags.. The following options would be great in a JSP tab. Option to always place <% and <%! and %> at column X (default 1). Otherewise, the <%, <%!, and %> will be placed according to the HTML indent level. require that the <% , and <%! tags have a newline after them, and the %> tag have a newline before them. Merge contiguous <% %> blocks, e.g. Could have special handling for oneline java statements. JSP - auto indent needs to be more robust. It shouldn't fail because of missing %> tag or because of HTML syntax errors that are downstream. One simple thing that should be done is IDEA should emit a matching %> tag whenever you type ]]>. If we have JSP code style settings I want (see above), then IDEA could also automatically format and position the cursor also. This will help out on the poor auto-indenter because it gets really confused if you don't have a matching %> tag.